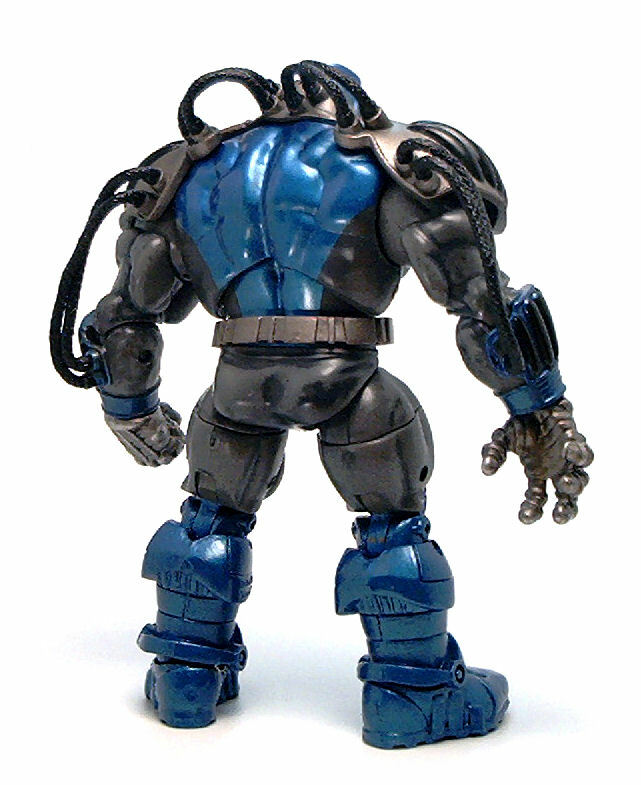 It wasn’t until Series 3 of the Marvel Universe line that Hasbro deemed fit to include Apocalypse into their roster. 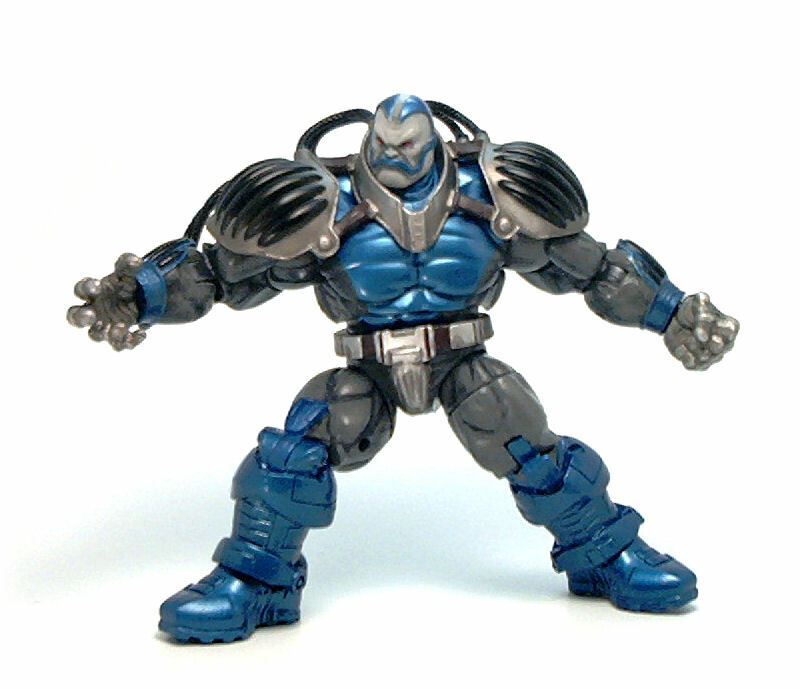 Apocalypse is a retool of the basic hulking body we saw introduced with the Juggernaut figure last year. The generic pieces share a very bulky construction, with bulging muscle groups under a smooth, textureless surfaces, except for the base of the neck, which shows striations that I have not seen on any other figure with the same basic configuration. The pieces unique to this character are the head, of course, but also the forearms and hands and the lower legs, starting at the knees. These all are nicely sculpted, with the face sculpted in the ominous Apocalypse scowl. There are also a few accessories that further help in personalizing this toy, like a rubber belt and more prominently, a combination of shoulder pads and neck guard. The shoulder pieces are connected to the collar by a couple of plastic bands, but also by a couple of rubber hoses that extend from the back of the neck piece towards a couple of plugs on the rear upper area of each shoulder pad. There are also a couple of exit plugs further down the pauldron from which another two rubber houses connect to the forearms. One thing that really surprised me about this figure is how good articulation is, despite it’s size. On the other bulky figure I bought along with this one, Skaar, I found that the rubber loincloth did limit the range on the hips more than I expected but Apocalypse, by not having a similar accessory, really makes the most of this articulation design. 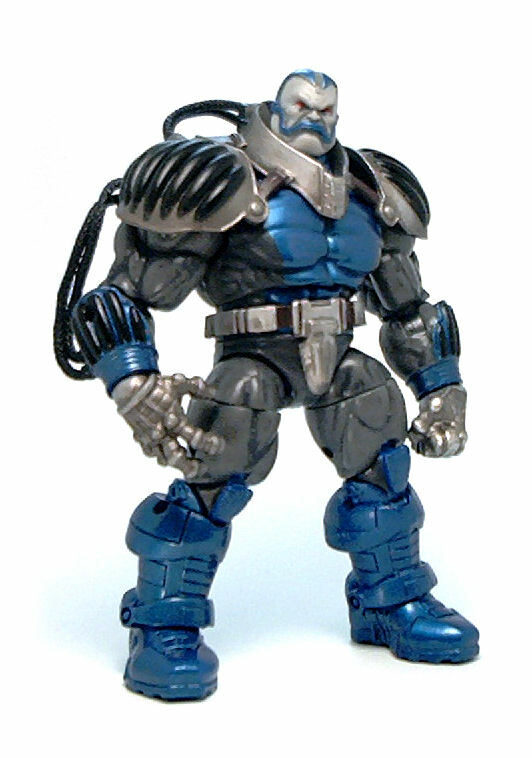 Apocalypse is molded almost entirely in dark gray plastic with a darker shading wash applied on the deeper cut details. All of the metallic blue areas are painted on, which gives a consistent look. Only the hands seem to be molded of silver plastic and the head from a lighter gray material. Overall the color scheme is quite effective and neatly applied. 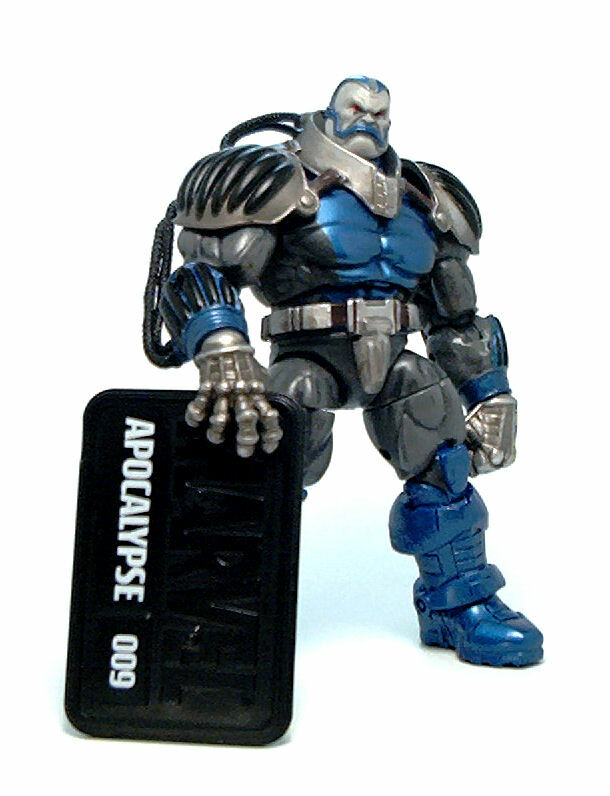 The only accessory included with Apocalypse is a black Marvel display base with his name and the numbers “009” printed on them in white font. 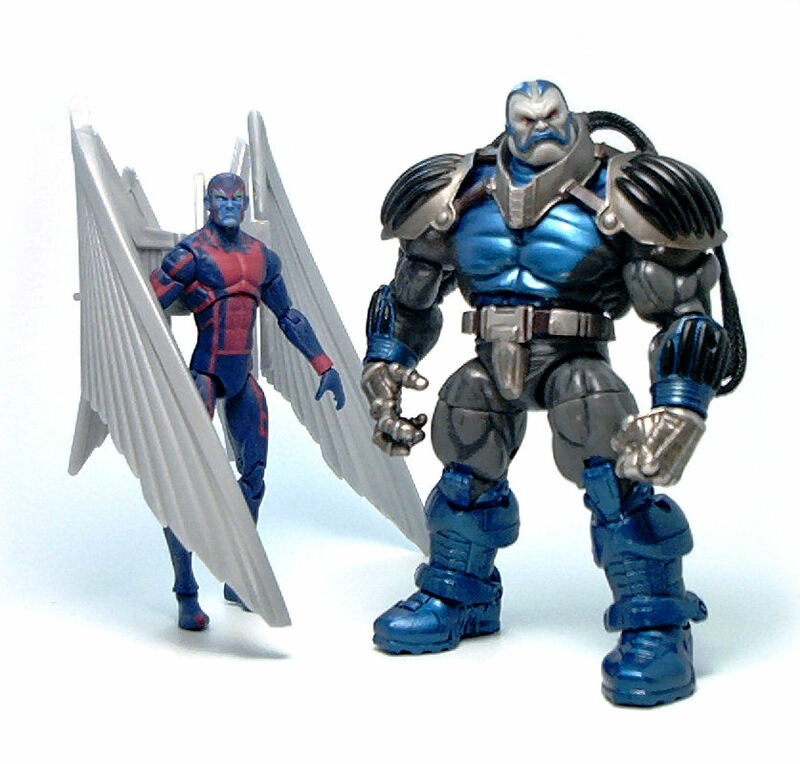 As usual with these larger characters, Apocalypse doesn’t really need the base to stand but it’s still a nice addition to have. 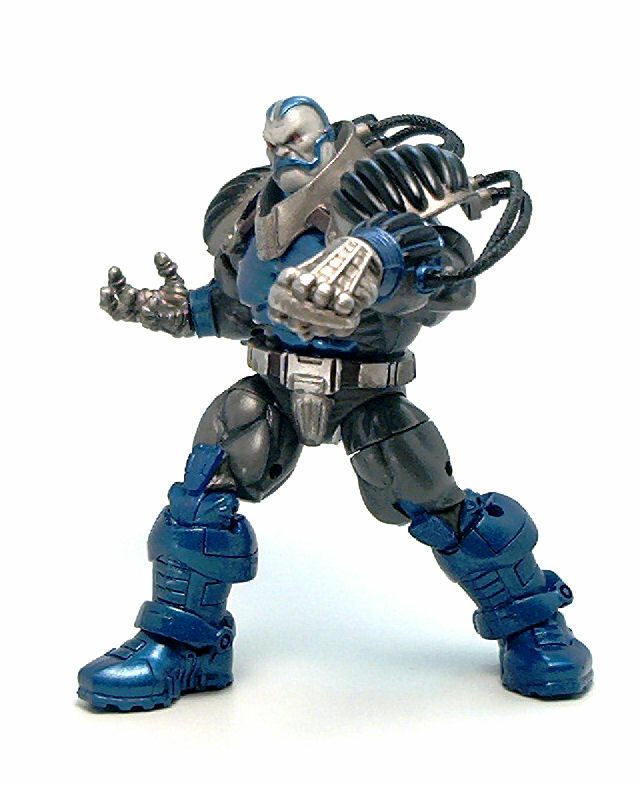 Overall, Apocalypse is one satisfying figure to have. I think it’s a good value from the amount of plastic you get, but it is also a well-designed toy and probably the most striking character in his wave of figures. I always thought Pocky was taller and little less wide. Cool figure though, love the hose and stuff.